A gazebo is a sound investment in any landscape. Gazebos can provide a focal point for an area or the entire yard. Most gazebos are designed with relaxation in mind, so it is important to design a landscape that can be enjoyed from the interior as well as the exterior. Add plants that highlight the gazebo but are not overpowering. Along with shrubs and plants, you may also want to incorporate statuary and garden accents. A rock and annuals garden combines a landscape feature with accent rocks and boulders. This works well for cedar-treated wood gazebos. Add boulders around the perimeter of the garden near the gazebo. Make sure you don’t block any views. Add a flagstone raised bed, if desired. A stone pathway can be created to lead up to the gazebo. Fill in the area around the gazebo with colorful annuals such as begonias, impatiens, geraniums and pansies. Stick to one base color or two contrasting colors, such as all pink or a combination of red and white. Line the path leading to the gazebo with flowering kale and marigolds. Stone statuary can provide a focal point in the center of the landscape. A small garden fountain or pond can be added, along with a stone bench on one side of the gazebo. If you have a gazebo with old-fashioned charm, like a white gazebo with trellis walls and scrolled edging, an old-fashioned landscape can accompany the gazebo. Incorporate perennials into the perimeter of the gazebo. Rose bushes, lilac bushes and peonies provide color and a scent that can be enjoyed both inside and outside the gazebo. Create a pathway with paver bricks to add character. Line the perimeter of the pathway with hostas and flowering annuals. Incorporate antique garden accents, such as a wrought iron fence and trellis, into the area. Fill in bare spots with black mulch and highlight with solar lighting. 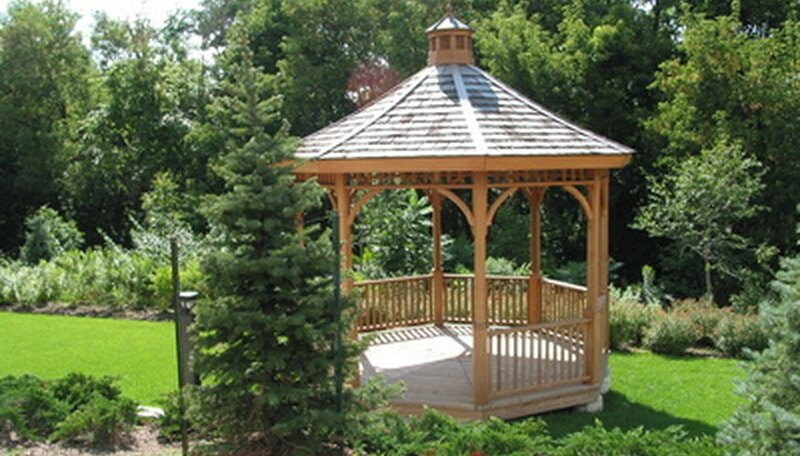 For a classic or contemporary gazebo, focus on incorporating seating and eco-friendly products to the landscape design. Make your pathway eco-friendly by incorporating recycled tire mulch as your foot traffic base. This design cushions the feet, blocks out weeds and remains friendly to the environment. Build a garden to surround the gazebo and edge off with an eco-friendly border. Add shade-loving plants such as hostas, ferns, lily of the valley and astilbe for a combination of greenery and flowering beauty. Incorporate a bench, gazing ball and birdhouse to draw attention to your gazebo.